Welcome to NTT20 Remembers: The Battle of Bramall Lane, where George and Ali - with contributions from Patrick Suffo and Alan Biggs - look back at the infamous game between Sheffield United and West Bromwich Albion in March 2002, the first professional football match in England ever to be abandoned due to lack of players. This episode is sponsored by Blacktype Bet. They are giving away a West Brom and Sheffield United kit from the Battle of Bramall Lane era. 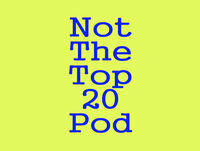 Head to twitter.com/NTT20Pod to find out more. You can sign up for a Black Type account online at www.blacktype.bet or via the BlackType app. Use the offer code 'NTT20' on the sign-up page for a £10 free bet - this must be used on a football selection. This is the first 'NTT20 Remembers' - a series in which George and Ali will review, recollect and present memories of iconic Football League games, teams, players or managers of the past, with contributions from those directly involved - in this instance: Patrick Suffo, who was sent off in the Battle of Bramall Lane, and Alan Biggs, the Sheffield sports guru and key performer in the aftermath, the lads sift through quotes and old footage to remind the listeners the characters, the incidents and the aftermath that made this day so special. Please feel free to get in touch to suggest any other potential topics.